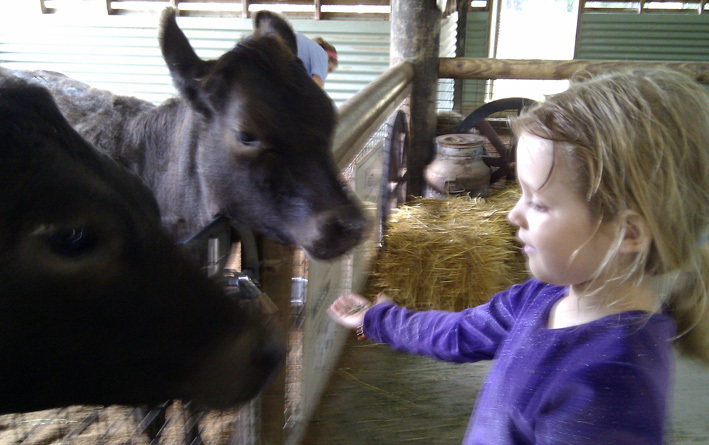 Selling the farm, soaring food imports, milk wars, mining the farm…is our food insecure or what? We all get insecure every now and then – it’s part of the human condition! The Australian newspaper article (Barret, 2011), “Growing concerns as food imports soar”, reported that our primary-producing nation, Australia, is now a net importer of horticultural produce. This makes our food insecure in times of natural and man-made disasters. The current Japanese nuclear crisis highlights not only the problem of food contamination lasting generations, with rainfall over the globe registering higher radiation levels, but also interruptions to the global supply chain, with ships avoiding the area. Food prices go up (like bananas at $12 per kilo due to the Queensland floods). Nutritious food is in short supply (Lauder, 2011). (http://www.abc.net.au/news/stories/2011/04/05/3182716.htm). The United Nations predicts that an increase of 50% in food production is needed by 2050 (Growcom, 2011:8). Growcom, a not-for-profit organisation in Queensland, released its Food Security Report (PDF file 862 kb)this month, saying that climate change, mining, peak-fertiliser and peak-oil, speculative trading, natural disasters, food safety and biohazards as well as lack of government planning make our food supply more vulnerable. It is, perhaps, the underlying ethical, political and philosophical questions behind these factors that will ultimately require debate and resolution, so that the causes, not just the symptoms, can be addressed. Growcom’s report (2011:31) quoted Fullbrook (2010): “food is not just another commodity, but has intrinsic fundamental value to people and society which must be recognised to achieve true food security”. Growcom questions the ethics of two major Australian supermarket chains dictating produce prices to farmers, illustrated by the recent moves to reduce milk prices (the milk war) in supermarkets. Global food trade makes prices volatile. It also favours monoculture farming. This erodes agricultural biodiversity, requiring a philosophical and scientific rethink of the “Green Revolution” (Growcom, 2011:21,55). The documentary, “The Future of Food”, by Garcia (2004), reveals that 97% of vegetable varieties are now extinct. Corporate ownership of seeds and plants prevents farmers from saving seed and reduces farm profitability. Australian government policy allows foreign governments to purchase Australian farms, shipping food home, excluding it from the market, and encourages mining operations which degrade agricultural land and pollute groundwater (in the spotlight now with the Lock the Gate campaign), leading to further food insecurity in Australia. Little encouragement is given to developing sustainable infrastructure and technology, designed to mitigate the effects peak-oil, peak-fertiliser, wild weather and diminishing resources; carbon generating industries like coal are still favoured. Consumers can contribute to food security. Growcom reports that consumers do not always “recognise the true value and worth of food” due to their weak links to rural producers (Growcom, 2011:30). They recommend educating consumers to accept food of a lesser cosmetic quality, purchase from sustainable producers and waste less food (we each waste 360kg of food a year) (2011:31). 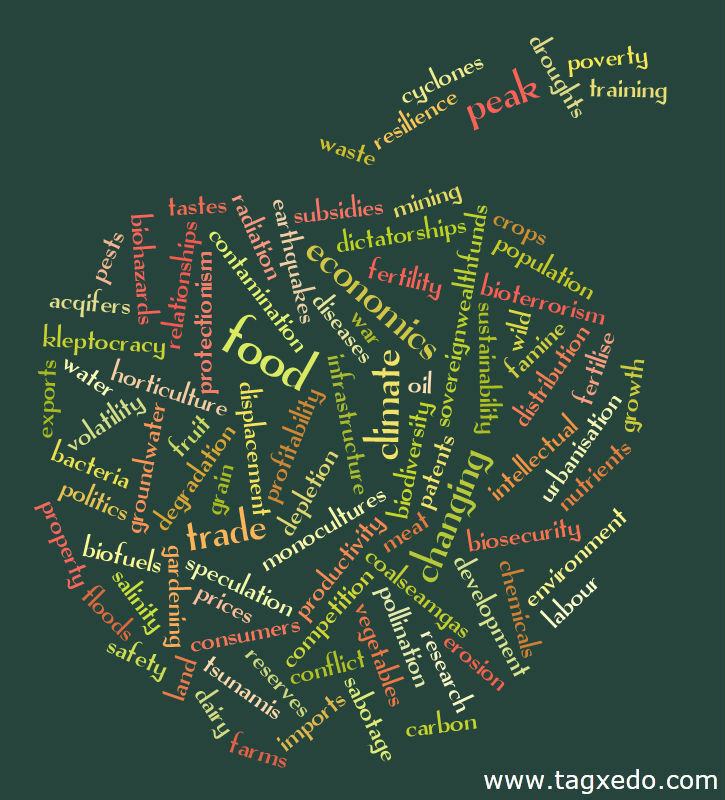 These are all positive ways we can get involved in increasing food security.